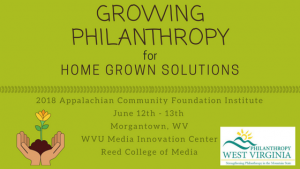 Over 30 community foundation leaders will be convening in Morgantown on June 12-13th for Philanthropy West Virginia’s Appalachian Community Foundation Institute. This year’s event is at WVU’s Media Innovation Center in the Evansdale Crossing Building. The conference focus is on “Home Grown Solutions” for philanthropy in West Virginia. The focus will be on donor development, social media outreach, and navigating the new tax reforms. FUNDING OPPORTUNITY: Pallottine Foundation’s New Grant Cycle Opens: The Pallottine Foundation of Buckhannon, WV has announced the opening of their 2018-2019 grant cycle. The foundation focuses on programs for healthier lifestyles. As noted by Executive Director Janell E. Ray, “The Pallottine Foundation of Buckhannon seeks partnerships with non-profit organizations with the potential to inspire healthier choices for the communities of Barbour, Lewis, Randolph, Upshur, and Webster counties.” Check out the media release by CLICKING HERE!